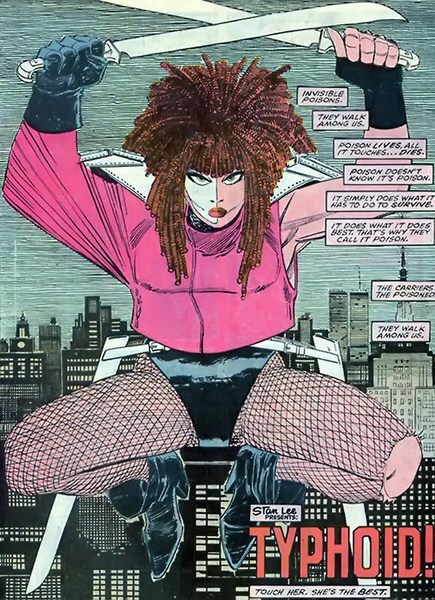 Is that a new look for Typhoid Mary? It seems like a mix of her classic look and her modern look. Anyway, i loved that one panel where Daredevil went to Damien Hellstrom for help in getting his secret identity back, Hellstrom suggested Mephisto. Daredevil just left, saying he's not that desperate. That was hilarious and awesome. Yeah, it's the outfit Maleev gave her, but her hairstyle is closer to her original look. She wore fishnet stockings in her original John Romita Jr look. 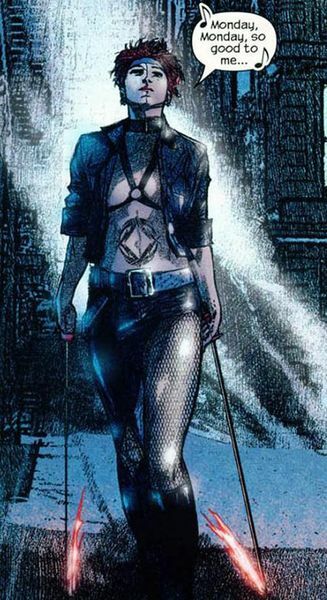 She also wore fishnets in Maleev's outfit. One weird thing about her, I think her curls are partly due to her powers. In the real world, severe DID people can have altered body chemistry for the mental changes, but Typhoid's hair literally alters from one panel to the next when her mind changes. It doesn't make much sense IMO if this is the catalyst they're using for Matt to pull an OMD. After being outed villains attacked his civilian life on a semi-regular basis and his wife was institutionalized because of it. It's not the only reason. There were several other factors, like the fact that he feared being Daredevil 24/7 could turn him into another Punisher. Although he was wrong about Banner, Banner rarely had time for his research. I've griped a lot about the abrupt shift from Waid's generally better-adjusted DD to Soule's once-again-tortured loner with a sidekick, so I feel like I need to say something nice here, because this story is almost exactly what I've felt was missing. Soule does a great job with Kirsten's voice and sense of humor, and nothing feels rushed or hasty (except perhaps Matt's early research into erasing knowledge of his secret identity, but that's forgivable as it goes nowhere). I do still feel like this story's coming out about a year later than it should have been, and I don't really buy one of the later complications, when the police are dubious about Daredevil handing over a well-known mob boss literally named Tombstone because "what if he's just chasing some publicity for his book?" Still, the basic flow of the story is sound, and much better late than never. We'll see if it sticks the landing. Maybe, but Daredevil was hardly the only post Secret Wars book with a time skip. As for the cops, the don't always get along with Marvel Heroes, they usually don't in fact. Plus they had a point, with the guy he saved in the wind, Matt didn't have any proof to backup his claim. They can't just take him on his word, especially since when he revealed his identity he had to admit to lying I'm court multiple times. I don't think too many of the time-skips involved a radical shift in the character's personality that went all but completely unexplained for over a year, though. I can see your point with the lack of witnesses, and it's one that Soule is also trying to make, but the cops' disbelief of his account still strikes me as more than a little over the top. If he were so distrusted, he wouldn't be so missed in New York. It's not even necessary for the story. What would be a lot more believable from them and still serve the overall purpose is exasperation that the one superhero they know to have legal training got so caught up in his old swashbuckling role that he forgot to secure some evidence or testimony that Tombstone's lawyers couldn't easily counter. "C'mon, man, don't you remember how this works? You had a whole CHAPTER on Wilson Fisk's legal evasions!" Again, that's not the case at all. There have been a lot of post Secret Wars books that have yet to explain what happened in the eighth month time skip. How is it over the top? It's pretty much how legal procedure would work. It's perfectly believable, because it would be the reality. And he was missed by the civilians, but not the cops. Hell, there have been many stories where a case against a criminal was thrown out because of vigilante involvement. How many of those books "involved a radical shift in the [title] character's personality that went all but completely unexplained for over a year?" Because that was my actual complaint. If it wasn't clear, I agreed with you about legal procedure, but my issue wasn't with legal procedure. Again, my actual complaint was about the cops' skepticism that Matt (whose status as a beloved celebrity should carry SOME weight) actually caught Tombstone-- again, a notorious mob figure with an arrest record as long as your arm, a history in prison, and teeth he's self-filed into fangs-- about to kill somebody. I have no problem when cops argue against heroes' flashy methods and disregard for procedure, and this could very easily have been one of those scenes and been fine, but it wasn't. But this is nitpicking, I admit. Waid and Soule have an interesting conflict in their points of view. A lot of it boils down to completion vs. compartmentalization. 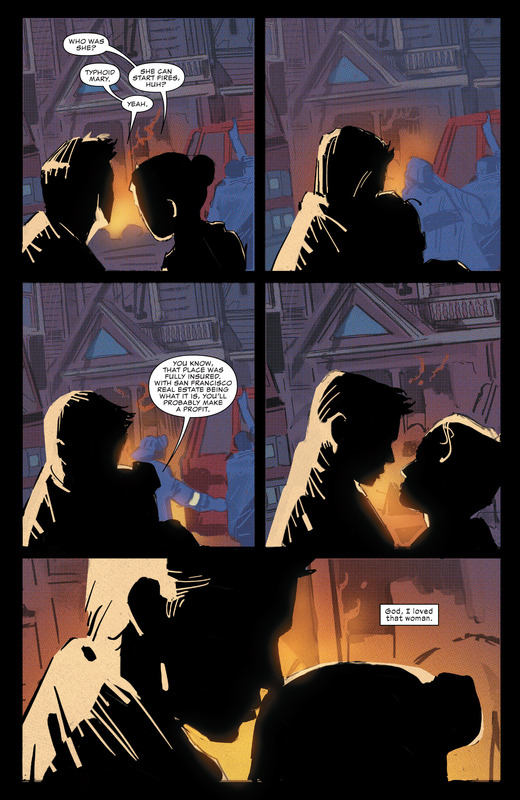 Waid argues that the right thing for Matt to do is to face the world honestly and openly, as one individual with no secret identities, and follow the advice of that sometimes-depressed jokester, Abraham Lincoln, that "most people are about as happy as they make up their minds to be." This resonated with me a lot, to the point where I've applied it in my own life by trying to present one coherent face to my family, my readers and my friends, where before I would have a separate "face" for each. Of course, there are limits. There are things I will tell my wife that no one else gets to hear, and not everything I write is something my family is interested in reading. (This post, for instance.) A policeman who sees brutal crime on the streets might divide his life more than I do, to keep his family and friends an oasis of relative innocence. There's a point past which that's not psychologically healthy. Still, Soule argues that Matt needs his old divided life back to be effective, and ultimately can't be fulfilled without being effective. I agree with the second part-- I'm not sure one can conclusively prove the first, but at least he's making a solid effort to do so instead of just taking it as read. 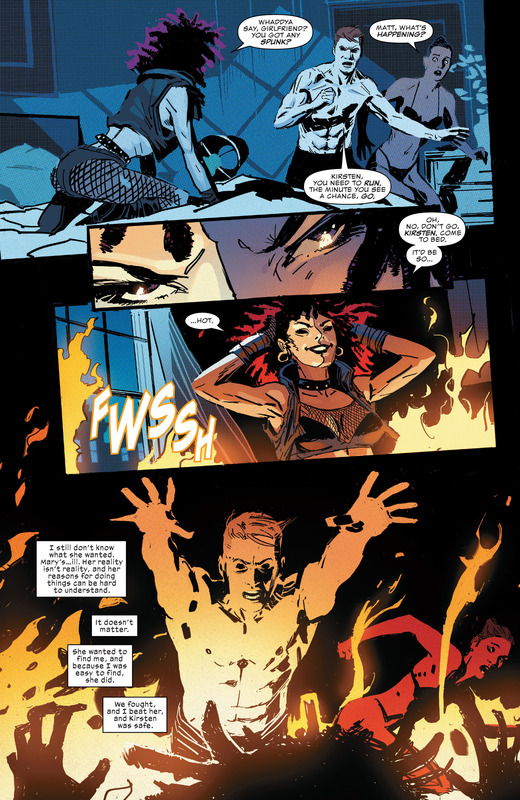 Yeah, Typhoid Mary can start fires, and a few other poorly defined psychic abilities, but her *real* power is still being alive so long after having slept with Matt Murdock. Black Widow's pulled off the same feat. Typhoid Mary's original reason was fairly simple; The Kingpin paid her a million dollars to break up Matt Murdock and Karen Page. And she succeeded.